Welcome to the beautiful Plettenberg / Sauerland! Enjoy sunny holidays in the F*** (DTV-Classification) Apartment Mai in Kückelheim, a district in the beautiful Plettenberg near the Oestertalsperre! 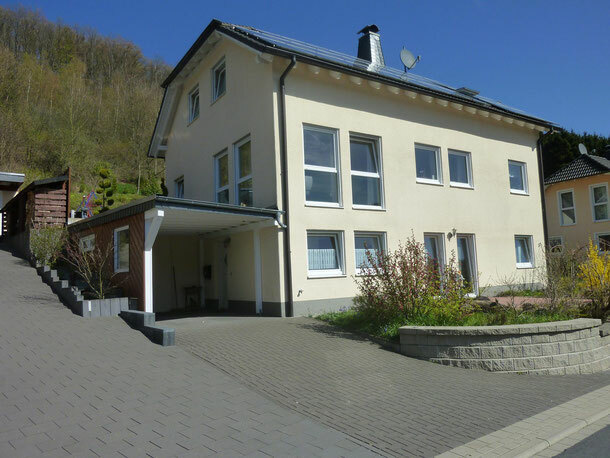 Our cozy, comfortable and tastefully furnished 63m² large non smoking apartment in a sunny location lies in the nature park Ebbegebirge. The apartment is located on a dead end right on the edge. It is an ideal starting point for hiking, mountain biking and motorbike trips. You have a carport directly outside the front door are available. For additional parking nearby. The nearby bike path is only a minute walk away. The nearest bus stop is just 600m away. In 700m distance there is a nice playground. From here you can quickly reach the city center and the Aqua Magis, Attendorn, Lüdenscheid or the nearby Ruhrgebiet! It was in 2016 renovated. Find three people and a small child place for relaxation! Our apartment has a double bedroom and cot. The beds are made upon arrival. The living room has a new LED TV and Blu Ray player and a generous sofa with sleeping function (here could find place to sleep two children lying area 1,30m x 2,00m) equipped. The kitchen is equipped with a Cerankochherd, a new dishwasher, coffee maker, kettle, toaster and all necessary kitchen utensils. A small stock of dishwasher tablets, salt, sugar and pepper is ready for you. A high chair is available on request free of charge. The bathroom has a shower, heated towel rails and hairdryers. Towels are available for you when you arrive. Furthermore, still has a large storage room, which is equipped with washer, dryer, clotheshorse and clothespins and detergent, to the apartment. This is available also as a storage area for bicycles. The whole apartment is equipped with a central floor heating. In summer, the 16 qm large terrace invites you to cozy barbecues. A barbecue and a sunchade, garden chairs, table and deck chairs are available. A small selection of children's toys is available. Also a selection of books and board games. The apartment has Wi-Fi to go! The apartment is perfect for bikers, hikers, family holidays and anyone who just wants to Recuperate!